We can help you find the poetry by form books you are looking for. As the world's largest independent marketplace for new, used and rare books, you always get the best in service and value when you buy from Biblio.com, and all of your purchases are backed by our return guarantee. E. P.. Near Fine in Very Good+ dust jacket. 1976. First Edition Thus. Hardcover. 071581141X . A very near fine 1976 1st thus facsimile reprint of the privately printed 1868 original in a very good plus bright unclipped dustwrapper. The book is in spotless red boards with a very slight bump to spine ends, no writing or stamps, clean pages. The bright dustwrapper is a touch creased and rubbed to the edges and corners - supplied in a new removable archival sleeve. Carefully packaged and posted within 48 hours from our wee bookshop in Scotland. .
1868. Boston: Ticknor and Fields, 1868. Original terra-cotta cloth decorated in gilt. First American Edition (published on the same day as the London edition and the Leipzig edition) of these two plays in verse form -- "John Endicott" sited in 1665 Boston and "Giles Corey" in 1692 Salem.~This copy is in terra-cotta cloth (one of three colors that were used in addition to several leather bindings), and has the TF pendant device in the supposed second state (with a hollow pendant). As Blanck points out, there were four identical printings dated 1868 (the first almost double the size of the other three combined), though there are at least two instances of type-batter (which this copy does exhibit) that may indicate a copy from late in the first printing or from one of the other three. This is a fine, bright copy. Blanck 12150. 1963; Riedinger and Riedinger, Schenectady, NY; Signed by Author on front endpaper, COLLECTIBLE! Second Publishing, A clean Very Good Hardcover in Very Good- unclipped Dust Jacket. "A book of verse-portraits of the people of the North Woods section of the Adirondack Mountains. The stories are tales of real neighbors, ranging from the humorous on to the spectacular and the tragic, vividly presented to the reader. Includes several photo illustrations." 125 pp. noted flaws: edgewear, mild chipping, tape repaired tears to jacket; ex-libris bookplate neatly affixed to front enpaper; very slight cant to spine. Overall attractive, Hard to Find Signed copy. Author Autograph. BOOKS IN TIME -- Hard to Find, Rare, Collectible & Out-of-Print Books for Less! 1891. London: T. Fisher Unwin, 1891. Original full vellum decorated in brown. First Edition, being a volume in Unwin's "Cameo Series" -- of which this is one of only 30 numbered copies on vellum signed by the publisher. This is a very good copy, the only notable defect being the usual minor darkening/foxing of the full vellum binding. These Cameo Series volumes have become highly collectible; the copies on vellum are scarce indeed. Krishnamurti (Women Writers) p. 113. London: Granada Books. 1983. Oblong Octavo Size [approx 22.8 x 15.5cm]. Very Good condition in Very Good Dustjacket. DJ protected in our purpose-made plastic sleeve. A nice copy. missing front free end paper. Brown illustrations. mark to the bottom edge of book. 246 pages For those who simply delight in the limerick's wit and playful earthiness this book is essential reading. . Reprint. Hardback. New York: James B. Pond. 1917. Octavo Size [approx 15.5 x 22.8cm]. Very Good condition. No dustjacket. Illustraetd with black and white plates by the author. Previous owner's details to front free end paper. 93 pages The huuman body described in limericks and illustrated by the author. . 1st Edition. Hardback. lulu.com. Very Good. 2016. First Edition. Softcover. Lower corner bends to both covers. ; 8vo 8" - 9" tall; 80 pages . 1905. Illustrated with Photographs by Leigh Richmond Miner. Decorations by Will Jenkins. New York: Dodd, Mead and Company, 1905. Original light brown cloth decorated in black, red and light blue, with front cover photograph affixed. First Edition so collected with photographs. These black dialect poems had first appeared in some of Dunbar's earlier unillustrated books; in this volume they appear along with photographs (of black life) by Leigh Richmond Miner, of the Hampton Institute Camera Club. Every page is also decorated with a light brown border, by Will Jenkins, an English illustrator who resided in Boston at this time; the binding design is also his (initialed).~This is a near-fine copy, the only notable flaw being some minor soil on the (blank) rear cover. One of the scarcer Dunbar/Hampton Institute volumes. Blanck 4955. 1832. A Fable -- In Verse. London: Charles Tilt, 1832. Original yellow printed wrappers. First Edition of this fable in verse form, accompanied by four Cruikshank plates. This copy is of the first issue, with the "Finden's Landscape Illustrations" ad on the outer rear wrapper; it does not have the eight pages of ads that appear only in some copies. Condition is very nearly fine -- unusually clean, and with only the very slightest of edgewear. Quite remarkable condition for such a fragile 180-year-old volume. Cohn 65. 1876. ["From the Author's Father"] Edited by William M. Rossetti and F. Hueffer. With a Memoir and Two Portraits. [In Two Volumes.] London: Tinsley Brothers, 1876. Original rose-brown cloth on beveled boards. First Edition -- of the second and final title by "Nolly" Brown, who died of pyæmia (blood-poisoning) at the age of 19, two years before this book was published. He was the son of the famous Pre-Raphaelite painter Ford Madox Brown; his sister Catherine married Francis Hueffer (born Franz Hüffer); and his half-sister Lucy married (in the year of Oliver's death) William Michael Rossetti. Born into the Pre-Raphaelite Brotherhood, Oliver (on the title pages his middle and last names are hyphenated) showed early genius in art, in poetry, and in fiction.~These two volumes, put together (and with a memoir by) his two brothers-in-law, contain all of his writing except for his novel GABRIEL DENVER, which had been published in 1873. In addition to several prose fragments and poems, the text consists of the two tales cited on the title page (each was an unfinished novel, which the editors finished based on knowledge they had of the author's plan) -- plus, the complete novel THE BLACK SWAN, which is perhaps the most important of the three, because it is, in fact, GABRIEL DENVER before the author was forced by its publisher to alter its plot and title. (THE BLACK SWAN is about a wife's revenge upon her husband and his lover; considered too "harsh" by the publisher, GABRIEL DENVER is instead about a spiteful cousin's revenge, and has a happy ending.) Incidentally, "dwale bluth" is an old North Devonshire name for the poisonous plant belladonna, or "deadly nightshade," and this dark tale is about a woman's obsession over it.~Each volume has a frontispiece portrait of the author by his father -- one as a four-year-old, and one at the time he was writing these pieces.~This is a very good set. We have encountered only about five copies in our 35+ years in business, and every one of them has had some chipping of the spine ends, which is the case here. There is other minor soil and edge-wear, and there is slight cracking of the original pale-yellow endpapers. Despite these flaws, we have not seen a better copy.~Wolff 880, which is a presentation copy to Swinburne "from the Author's Father" ("The death at nineteen of this brilliantly versatile and precocious artist and novelist, son of Ford Madox Brown, and brother-in-law of William Michael Rossetti and Francis Hueffer, deeply distressed the boy's father and all the brethren of the Pre-Raphaelite movement. Both his books are rare. "); Wolff Strange Stories p. 40 ("Had The Black Swan appeared as the work of a mature and experienced novelist, it would have been an arresting novel. As the first effort of a seventeen-year-old writer, it is quite unbelievable").~Note: the front endpaper of Vol I bears the inked inscription "From the Author's Father". We know of several such copies (some inscribed to an individual such as Wolff's copy above, some just like this copy, but always "from the Author's Father"; we are not handwriting experts but, comparing the hand to Ford Madox Brown's, we could not definitely claim it to be his; the volumes were perhaps sent out at his request by the publisher. 1933. London: Macmillan and Co., 1933. Original blind-stamped olive green cloth with gilt-decorated spine, with dust jacket. First Edition, which consisted of 2000 copies, of one of the great collections of poetry from Yeats's later years. Included are "Coole Park," "For Anne Gregory," "Byzantium," "A Dialogue of Self and Soul" and the Crazy Jane poems. (There had been a briefer collection by the same title, published in New York by the Fountain Press in 1929, but that collection did not include, for example, four of the five poems cited above.) The elaborate binding design is by T. Sturge Moore (signed TSM).~This is a near-fine copy (minor soil); the dust jacket, reproducing Moore's design, is very good-plus with a few tiny chips at corners (its spine browned as always, and with a small damp-mark). Wade 169; Connolly's MODERN MOVEMENT #56b. 1915. London: Sidgwick & Jackson, 1915. Original grey printed wrappers. First Separate Edition, published five months after 1914 AND OTHER POEMS (which included these sonnets). Included is "The Soldier," beginning with Brooke's famous lines~If I should die, think only this of me:~That there's some corner of a foreign field~ That is for ever England.~Brooke had in fact died in a corner of a foreign field by the time this was published. This is a near-fine copy (very light soil, a couple of faint creases). Keynes 28. 1892. New York: Charles Scribner's Sons, 1892. Original pale blue paper-covered boards with white parchment spine and fore-tips. First Edition -- which is to say, the large-paper issue, preceding the trade issue -- of this famous collection of children's verse. Some poems had appeared in a couple of earlier Field books, but much had appeared only in newspapers or magazines. Included are Field's best-known poems such as "Wynken, Blynken and Nod" and "Little Boy Blue. "~This is #146 of the 250 Van Gelder large-paper copies signed by "Charles Scribner's Sons"; according to Blanck (citing the publisher's records), these 250 copies were issued on November 21st, while the trade copies came out on December 3rd. It is in just-about-fine condition, with scarcely any of the cover soil typically found on such a light-colored binding. Blanck 5750. 1851. [inscribed by Meredith] London: John W. Parker and Son, n.d.. Original blind-stamped purple cloth. First Edition of George Meredith's first book, a volume of verse published when he was only 23 (and including many poems written at the age of 18 and earlier). Meredith had just married the widowed daughter of Thomas Love Peacock (to whom this book is dedicated); after she deserted him in 1858 (taking their son), Meredith acquired a strong distaste for this "juvenile" verse related to his marriage. Meredith then did what he could to suppress the edition, reportedly managing to destroy 300 copies.~This copy is in blind-stamped blue-violet cloth, lettered in gilt on the spine; Collie cites only the binding in green cloth, but Hayward notes this one as well ("no priority appears to exist"). This copy, rather than having a printed errata slip tipped in at the rear, has the three errata written out in ink on the rear free endpaper -- apparently in Meredith's own hand. Condition is near-fine (spine slightly faded, a few faint spots). Collie XXXVI; Buxton Forman 1; Hayward 270. Housed in a cloth slipcase.~This is a presentation copy inscribed by Meredith at the top of the title page, "J. W. Millais Esqre | from the Author." John William Millais (1800-1870) was the father of John Everett Millais, the famous artist and illustrator who was one of the founders of the Pre-Raphaelite Brotherhood (and who it is believed first brought Meredith and Dante Gabriel Rossetti together). Meredith's first book is rather scarce; needless to say, presentation copies of his first book are much scarcer. 1896. Edited by Mabel Loomis Todd. Boston: Roberts Brothers, 1896. Original white cloth decorated in gilt with green cloth spine, all page edges gilt. First Edition, which consisted of only 1,000 copies.~Emily [1830-1886] attended Amherst Academy; spent one year (1847-48) at South Hadley Female Seminary (ancestress of Mount Holyoke College); visited Washington and Philadelphia for a few weeks in the spring of 1854, while her father was in Congress; spent part of 1864 and 1865 in Boston to be treated for eye trouble; and died at fifty-five of Bright's disease. That is the entire record of her outward life. It is the least important thing about her.~To account for Emily Dickinson the recluse, who for twenty years never went farther than her garden gate, who saw no one but her family and a very few chosen friends, who dressed always in white and wrote her poems secretly on scraps of paper, rolled and tied with a thread and thrust into bureau drawers, one need not imagine any strange mysteries of love and renunciation. Certainly Emily loved an unknown man, loved him deeply and unceasingly, but could not or would not marry him...~She had the same sort of demanding, tyrannical, autocratic, and possessive father as did Elizabeth Barrett; and she did not escape... Emily's lover was not strong enough to overcome the terrific attachment, half love, half fear, that tied her to [her father] Edward Dickinson... Her hermit life, driven into and upon herself, was her answer to the tyranny which turned an ardent, gay, witty girl into a shy and withered spinster... [K&H]~Other than a few poems anonymously contributed, none of Emily's verse was published during her lifetime (-- to avoid what she called "the auction of the mind"). After her death, her brother Austin and sister Lavinia (who controlled the manuscripts) arranged to have a volume published in 1890; one of the friends who edited it, T.W. Higginson, could not convince Houghton Mifflin (for whom he worked) to publish it -- as they considered it "confused." Roberts Bros tentatively issued just 500 copies, and was then dumbfounded to see the book meet unprecedented demand and quickly run through many printings. Thus a "Second Series" of additional poems was published in 1891 (960 copies), followed by this "Third [and last] Series" in 1896. The cover design for all three volumes includes Indian pipes -- from a painting Mabel Loomis Todd had given to Emily in 1882 that thereafter hung in the latter's bedroom -- what Emily called her "preferred flower of life. 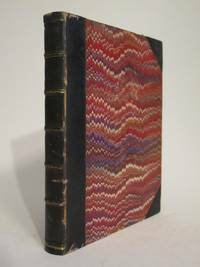 "~The 1,000 copies were bound in two similar cloth bindings (no priority, but of differing price). Binding A, as here, is white cloth with gilt Indian pipes, with pea-green cloth spine and all page edges gilt (priced at $1.50); binding B is grey or olive cloth, beveled board edges (also with the Indian pipes), with only the top edge gilt (priced at $1.25). Of the two cloth bindings, this "A" is generally a bit more sought-after -- because it is a closer match to the only binding in which the First Series of poems had come out, and because today "A" binding copies are scarcer than "B" binding copies.~This copy is in very good-plus, perhaps near-fine condition -- the only noteworthy flaw being a damp-mark at the top of the rear board. The white cloth is generally rather clean, the front cover and spine gilt is bright, and the endpapers are intact. Myerson A4.1.a. 1895. Boston and New York: Houghton Mifflin and Company, 1895. Original light green cloth pictorially decorated in gilt, all page edges gilt. First Edition of this collection of juvenile tales and verse, published the year after Celia Thaxter's death, and edited (with a brief Preface by) Sarah Orne Jewett. Of the poems, the last thirteen listed appear here in book form for the first time; the others had appeared in earlier Thaxter books. Near-fine (one small rub on the front cover gilt). Blanck 19927. 1846. ["I shot an arrow into the air"] Cambridge: Published by John Owen, 1846. Original white wrappers decoratively lithographed in gold. First Edition of this early collection of poems -- only nine of which are appearing in book form for the first time here, but notably, one of the nine is "The Arrow and the Song" ("I shot an arrow into the air, | It fell to earth, I knew not where..."). In addition, this volume contains Longfellow's "translation" (really his own phrasing) of the poem "Retribution" from a thought originated by a 16th Century German poet: "Though the mills of God grind slowly, yet they grind exceeding small; | Though with patience he stands waiting, with exactness grinds he all. ").~Although THE BELFRY OF BRUGES's title page is dated 1846, it was actually published at Christmastime 1845: it was the custom to post-date title pages issued at the tail end of a year. It was intended that the wrapper be dated 1846, as well -- but Owen had already had the lithography done with "1845," and in view of the cost to re-do it, the error was allowed to stand. (In any case, there are no copies with that 1845 date on the title page. )~This copy is still in the original delicate paper wrappers. It is in near-fine condition (covers quite well preserved, spine a little browned and rubbed). Blanck 12083. Housed in a cloth clamshell case with leather label.~Provenance: the half-title bears the penciled signature of S.T. Darrah, and the inside front cover bears the bookplate of Robert Darrah Jenks ("Library of Robert K. Darrah | May 22nd, 1885"). Annie (Mrs. James T.) Fields wrote a lengthy obituary of RKD (1818-1885) of Boston; his nephew RDJ (1875-1917) was the subject of the privately-printed "A Memorial and a Tribute from His Friends" (Philadelphia 1917). London: Bloomsbury Books. 1991. Octavo Size [approx 15.5 x 22.8cm]. Very Good condition in Very Good Dustjacket. DJ protected in our purpose-made plastic sleeve. A nice copy. 304 pages A connoisseur's collection of limericks, old facourties and new gems, compiled by E Parrott. . Reprint. Hardback. Boni, 1924. 1st. Hardcover. A near VG+ bright copy. Verses by Chappell & pictures by Hogarth. 8vo pamphlet pp32 F- Poetry.